This is a 18 month to two- year course that teaches the skills of hairdressing from shampooing and conditioning also cutting, colouring, men’s cutting and blow drying. 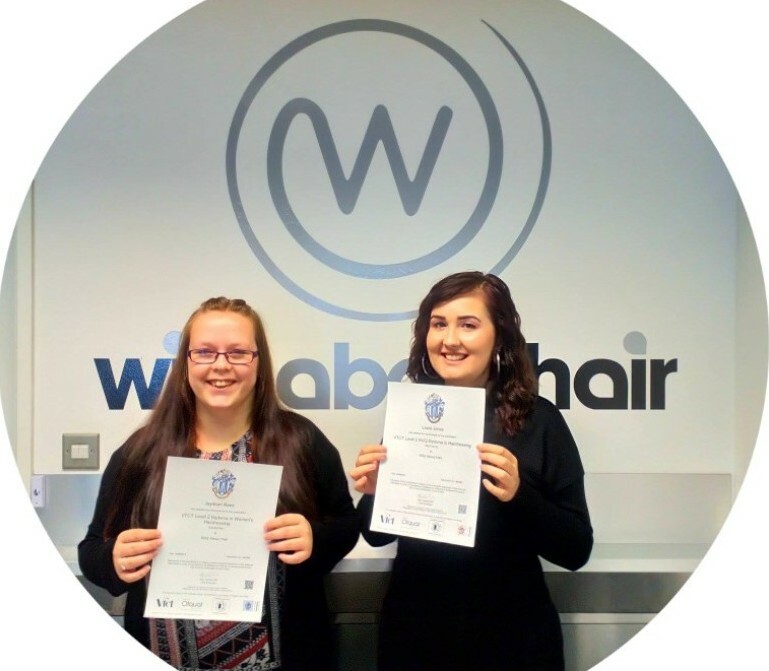 This course includes work experience and this will enable you to learn valuable skills for your hairdressing in a true salon environment. Private course students are exempt from studying Maths and English. Torquay Academy students also study Maths and English GCSE at Torquay Academy sixth form if a GCSE grade C or above in these subjects have not already been achieved. FUNDING AVAILABLE - YES (16 -18 FUNDING MAY BE AVAILABLE ON REQUEST). We offer traineeships for learners who are new to hairdressing, this includes work experience within a salon to develop the skills required for an apprenticeship. We also cover writing CV and functional skills in Maths and English. We also teach you the theory and skills in hairdressing for shampooing and conditioning and blow drying and setting techniques. Apprenticeships: We work closely with Salons in the bay who offer apprenticeships in hairdressing. We can organise interviews with salons who have vacancies and then we offer the training for your apprenticeship which can be salon based at your job or you can attend our academy once a week for your training. This will include Maths and English functional skills if you have not achieved GCSE level C or above. You will cover cutting, colouring, styling, reception, and shampooing and achieve a level 2 NVQ in hairdressing. This is a two- year course. This is a two- year course that teaches the skills of advanced hairdressing from disconnection in cutting and colouring techniques to creative advanced blow drying and long hair styling techniques to perming and reception. You must be working as a stylist or work experience in a salon that allows you to be working a column as a stylist at least one day a week and your training will be once a week at the academy. The purpose of the VTCT Level 3 NVQ Diploma in Hairdressing qualification is to provide you with the knowledge, skills and understanding to be a hairdresser/stylist. This qualification is based on the Level 3 Hairdressing National Occupational Standards (NOS) and is recognised by the UK’s leading professional hair associations (The Hair Council and National Hairdressing Federation) as being fit for purpose to prepare you for a career as a hairdresser/ stylist. This qualification is designed for learners aged 16 years or over and has both mandatory and optional units for you to achieve. The mandatory specialist units are; creatively style and dress hair, creatively cut hair using a combination of techniques, creatively colour and lighten hair, provide client consultation services. The optional section of this qualification allows you to choose specialist units you would like to study, depending upon your chosen career pathway as a hairdresser/stylist and includes; fulfill salon reception duties, provide a variety of relaxing services, hair colour correction services, provide creative hair extension services, create a variety of permed effects, develop, enhance and evaluate your creative hairdressing skills, provide specialist hair and scalp treatments, contribute to the planning, implementation and evaluation of promotional activities, contribute to the financial effectiveness of the business, cut men’s hairstyles. You will be expected to gather evidence of both the practical skills and underpinning knowledge for each unit you study and create a ‘portfolio of evidence’ for the qualification. On successful completion of this qualification you will be in a position to apply for employment as a hairdresser/stylist. Apprenticeships: We work closely with Salons in the bay who offer apprenticeships in hairdressing. We can organise interviews with salons who have vacancies and then we offer the training for your apprenticeship which can be salon based at your job or you can attend our academy once a week for your training. This will include Maths and English functional skills if you have not achieved GCSE level C or above. You will cover creatively cutting, creatively colouring, creatively styling, reception, and gents cutting to achieve a level 3 NVQ in hairdressing. This is a two- year course. This unit is about the precision cutting skills involved in barbering to achieve a variety of looks and neckline finishes for men using club cutting, scissor over comb, clipper over comb, thinning and freehand techniques. In this unit, razors will only be used for removing unwanted hair outside the outline shape. The VTCT Level 2 Certificate in Barbering is a qualification that has been specifically designed to develop your practical skills in the creative art of cutting men’s hair, the specialist work of cutting facial hair and how to offer a good consultation service for clients. Underpinning this qualification you will develop a sound knowledge of health and safety whilst working in the barbering industry. You will also develop a knowledge and understanding of the practical skills learned throughout this qualification. The purpose of this qualification is to develop your practical skills to a high level of occupational ability to enable you to perform your own salon services.